Moscow is truly one of the most exciting cities in the world but it's not like the rest of Russia at all. I would dare to guess, Russia is an earthly embodiment of infinity, and that is what makes Russians so unpredictable, freedom-loving escapists, so difficult for understanding and definition. That was what let Sir Winston Churchill called Russia "a riddle wrapped in mystery inside an enigma" . The country is spread over nine time zones and all climatic zones except tropical. There is plenty to see and to do in Russia wherever you travel to there. Each Russian town provides tourists with its own licensed guides, and on the tours out of Moscow I act as a tour-leader who coordinates a tour and runs it to a budget, helps to solve travel problems, trying to be a liaison between travelers and local people. The tour is a good way to start your exploring of Russia and get a first sense of the country as you may experience cultural highlights and vividness of both capitals along with tranquility of traditional life in the Russian provinces. 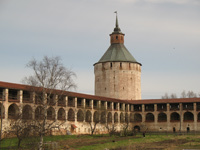 Novgorod is an ancient cradle of the Russian statehood, in the 12th century Novgorod Princes rulled over the country, and its Byzantine Cathedral of St. Sophia is one of the oldest temples in Russia. Vladimir attracts with the best samples of majestic medieval Russian architecture, while miniature Suzdal is like a medieval fairy tale itself. 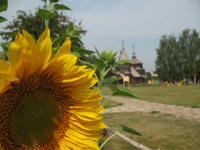 To look at photos of Suzdal & Vladimir. You start from St. Petersburg and neighboring Pushkin town housing the Catherine's Palace, one of the most beautiful imperial residencies of Russia. After exploring Suzdal, the gem of the Golden Ring route, you move towards the Volga River to see Kul Sharif Mosque and try manti damplings in Tatar Kazan. Then you travel across Siberia on the Trans-Siberian Railway to make a stop in Yekaterinburg (Europe - Asia border) where the last family of the Romanov dinasty was executed, and in Tobolsk, the foremost Siberian city. At the same time you may visit the Rasputin Museum in the neighbouring Pokrovskoe, and industrial Tyumen. The train journey through Siberian villages and endless coniferous forests brings you to Moscow. 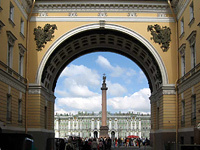 To look at photos of St.Petersburg. If you have time and aspiration for feeling yourself a Russian, this long travel is definately for you. 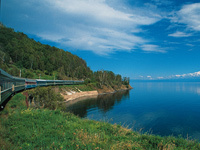 The legendary Trans-Siberian Railway, 9259 km (5,753 miles) long, connects hundreds of large and small cities of the European and Asian parts of Russia. It takes eight days to complete the journey from Moscow to Vladivostok but you need more to extract all delights of the travel. So it is better to start your tour from St. Petersburg and visit charming Suzdal on the way to Moscow, and only afterwards come on board of the TSR train and let yourself in for Russian adventures with drinking vodka and watching the wonderful scenery pass by. There is a number of places on the route worthy to be visited at least in short, and among them are Yekaterinburg, Irkutsk, Khabarovsk and, certainly, Lake Baikal, the purest freshwater and the most ancient lake in the world. The final point of the travel is Vladivostok. Besides invariable Moscow and Petersburg, this tour embraces one of the most beautiful and mysterious lands of the country, Karelia, stretching to the Arctic Circle. You are welcome there if you dream of polar nights and frozen tundra, abundance of lakes and islands lost in severe seas. After a week in Moscow and St. Petes, you arrive to Petrozavodsk, the capital of Karelia and further up to Kizhi Island, for the unique open-air museum of wooden architecture. Your next jump is to Sortavala from where you depart by boat to the Valaam Island, to spend a day in the old monastery. Then your way lies to Kem, there you can take a boat for the Solovetsky Islands (Solovki) and on the way to the archipelago there is a chance to spot white whales inhabiting the area. Despite of being a prison camp in Stalin times, Solovki is still considered to be one of the most powerful spiritual centers of Russia. The Solovetsky monastery, founded in the 15th century, attracts pilgrims from all over the country. While in Karelia, you may experience some local activities like rafting down the Shuya River in summer or riding a snowmobile on the frozen lake of Onega in winter. To look at photos of North-West Russia. The Altai Mountains, lying at the very heart of Asia, is translated from Mongolian language as "golden mountains". 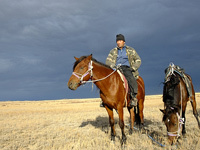 You may explore this area on foot or follow locals and ride local breed horses through the Altai wilderness. Having started your tour in Moscow, you take a flight to Barnaul, the capital of Altai region. The popular route crosses the area of Lake Ak-Kem and Belukha Mount, the highest mountain in Siberia, both on the UNESCO World Heritage List. Summer Altai takes you into diverse world of alpine meadows and dry Mongolian steppes, dense forests and narrow mountain passes. To enjoy this ride you need to be in good physical shape. This is one of the most fascinating and culturally rich tours beyond Russia and within the former USSR. 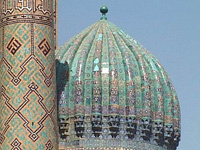 In spite of still suffering from economic stagnation, Uzbekistan is justly famous for its hospitality and is still unsurpassed in ability to treat and entertain guests. In the past this land was a melting pot of religions, nations and cultures, and tolerance of local people always provided the peaceful coexistence of different beliefs. Visiting the old Silk Road cities, "a necklace strung out like a pearls across the Orient", you will not only admire sky-blue domes of grandious madrasahs and wander the narrow labyrinths of old towns, you will have a wonderful rest like at your own home, having been seated atop the pillow hill in a teahouse, with a bowl of pilau in the hand and many smiling faces around.